In honor of our 45th year we’ll be highlighting some area of RSS. We’ll talk about its history, people and place in the neighborhood. To kick things off, here are 5 facts you may not know. 1. 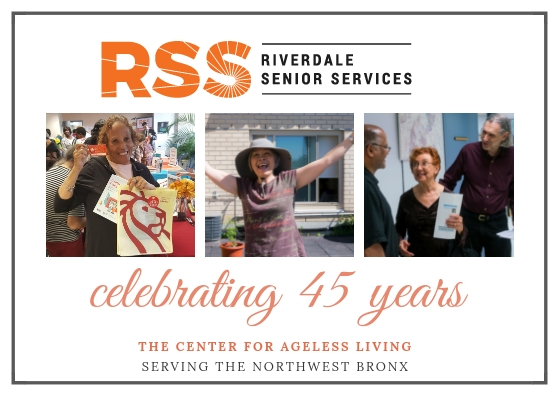 In 1964 Sadie Levine, Eleanor Katzman and Julia Blumenthal launched a once a week program at Riverdale Neighborhood House for older adults in Riverdale. 2. In 1973 Councilwoman June Eisland informed that group that government funds were available. Through the efforts of 3 agencies—Riverdale Neighborhood House, Riverdale Mental Health and the Riverdale Y—the Riverdale Senior Center was established. 4. In 1984 the name of the Center was changed to Riverdale Senior Services to reflect the diversity of services offered. 5. At about a rate of 20,000 meals a year (many more now), RSS has served over 1 MILLION meals! What are your memories of RSS? Please share your stories, pictures and memorabilia with us! Contact Margie Schustack at 718.884.5900 x29, Come up to Suite 106 (or she can come down!) or email mschustack@rssny.org and SHARE!